"Now calm down. It appears the embassy in Cairo has decided to agree with me. Now let's all pivot to the economy and Obama's failures." On September 11th, Mitt Romney made a pact with the Obama campaign to not release any negative attacks on the opposing candidate out of respect for the Americans that had lost their lives on that tragic day. 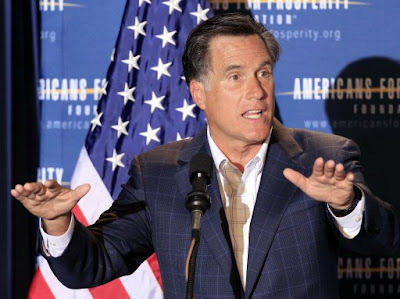 Later in the day Mitt Romney broke that promise to launch a factually-void attack on the president for the civil unrest and subsequent attacks by protesters on an American embassy and consulate in Africa. "The embassy in Cairo put out a statement after their grounds had been breached," Romney told reporters. "Protesters were inside the grounds. They reiterated that statement after the breach. I think it’s a terrible course for America to stand in apology for our values. That instead, when our grounds are being attacked and being breached, that the first response of the United States must be outrage at the breach of the sovereignty of our nation. An apology for America’s values is never the right course." Let's ignore the fact that the embassy released their statement six hours before the grounds had been breached, not after like Mitt Romney insisted, and let's also ignore the fact that the embassy released this statement and not the Obama administration. Let's also ignore the fact that the Obama administration condemned the attacks before Romney fired off his attack. Let's instead focus on the content of the statement issued from the troubled embassy. After Mitt Romney has spent days falsely attacking the administration, being thoroughly debunked by almost everyone in the media, Mitt Romney has decided to shake his Etch-a-Sketch once more and make an entirely new argument, and this one winds up agreeing with the initial embassy statement Romney criticized in the first place! "I think it’s dispiriting sometimes to see some of the awful things people say. And the idea of using something that some people consider sacred and then parading that out a negative way is simply inappropriate and wrong. And I wish people wouldn’t do it," he said. "Of course, we have a First Amendment. And under the First Amendment, people are allowed to do what they feel they want to do. They have the right to do that, but it’s not right to do things that are of the nature of what was done by, apparently this film." Mitt Romney's statement may actually beat his last hilarious attempt to rewrite the narrative when he said the White House agreed with him over his attack on the president. “What I said was exactly the same conclusion the White House reached, which was that the statement was inappropriate. That’s why they backed away from it as well,” Romney told George Stephanopoulos. This is fairly impressive verbal gymnastics. Yes, the White House distanced itself from the initial statement put out by the U.S. Embassy in Cairo that condemned a crass anti-Muslim film that had been making the rounds on the Internet. And yes, Romney also criticized the issuance of that statement. But Romney also accused the president of sympathizing with the rioters because of that initial statement, despite the fact that the embassy released it hours before the attacks took place. And while Romney may want to focus attention elsewhere, it was that specific attack on Obama that had Democrats, foreign policy experts, and a good chunk of Republicans criticizing his conduct. His statement didn't comport with the actual timeline of events. So does this mean Romney is now sympathizing with the rioters and being an apologist for America with his latest flip-flop?